Two days before the Stanley Cup Final started, Daniel and Henrik Sedin got an interesting phone call – from Sweden’s royal family. The Sedins were informed they were one of six nominees for the Victoria Stipendium, an annual award given to the Swedish athlete of the year by Victoria, Crown Princess of Sweden. Every year since Crown Princess Victoria was born in 1979 the honor has been presented to an athlete or athletes as part of the princess’ birthday celebration, beginning with Ingemar Stenmark, the greatest slalom and giant slalom alpine skier of all time. The Victoria Stipendium has been awarded 32 times, with hockey players now representing three of the recipients (Sedins count as one). In 1980 four-time Stanley Cup champion Stefan Persson received the award before two-time Cup champ Peter Forsberg was honoured in 1994. The Sedins were a game from adding Stanley Cup champion to their resumes, but finishing an outstanding season for both with the Victoria Stipendium is the best consolation prize anyone could offer. “It’s a pretty big deal over here, it’s usually big time Olympic winners and stuff like that that gets it, so it was surprising that we got it this year,” said Henrik Sedin, via phone from Sweden. As part of Victoriaweek 2011, five days of festivities celebrating Crown Princess Victoria, a ceremony took place on July 14 at Borgholm's Idrottsplats in Borgholm, a city on the island of Öland in the Baltic Sea. 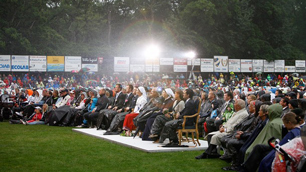 Some of Sweden’s top musicians performed in front of an estimated crowd of 2,000 people, including Crown Princess Victoria and Prince Daniel, Duke of Vastergotland, King Carl XVI Gustaf and Queen Silvia of Sweden, Princess Madeleine, Duchess of Halsingland, Gastriklandand Prince Carl Philip and the Sedins. Talk about rubbing elbows with Sweden’s elite. The Sedins, supported by a mass of family, were presented glass plates engraved with previous winners, plates their kids will surely never eat dinner on. The day, in which the Sedins found time to have lunch with Forsberg, was a lot of fun, according to Henrik, but not everything went as planned and newspapers in Sweden are still buzzing. It rarely rains on the island of Öland – and by rarely I should say that leprechauns ride unicorns more often – and it had never before rained on Crown Princess Victoria’s birthday. Yes, I said had never rained. It poured all day and although the show went on as planned, it took a comical turn when the royal family arrived at the ceremony and mistook garbage bags placed on their chairs to keep them dry, as rain gear. Next thing you know King Carl XVI Gustaf is punching holes for his arms and head into a garbage bag. That’s my kind of King. 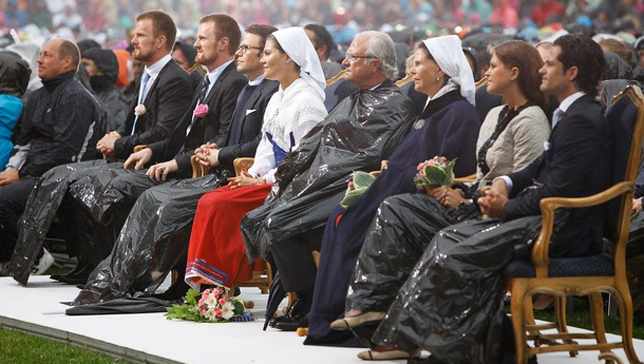 Not wanting to stand out, Daniel and Henrik followed suit and placed garbage bags over their legs during the ceremony. When in Rome..or in Sweden I guess. 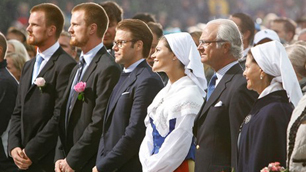 The Sedins, who returned to Örnsköldsvik two weeks ago and have been working out diligently every waking minute, did not sign any autographs for the royal family, not even for Prince Daniel, an avid hockey fan. The Canucks are now part of the royal kingdom, however, as the Sedins presented Crown Princess Victoria with a Canucks jersey that she accepted with a smile.